People have discovered and embraced the amazing relaxation that hot spas can give. In today’s stressful society, anybody would want to go home to a warm therapeutic massage that only hot tubs can offer. Well that’s not a problem. Because there are a lot of choices of varying brands and designs that are available in the market. All you need to know is what you want so that you can choose which kind of hot spa will best fit for you. Hot tubs have developed. From hot pools for the rich to large scale public baths for ailment treatments to private home baths. Now, it has grown further into providing therapeutic relaxation and entertainment. People are buying hot tubs to rejuvenate themselves. From physical and as well as other stresses and to spend a fun day with family and friends. Many brands manufacture designed hot tubs to serve these two purposes. Each convincing that they are the best buy. If you are looking into a spa experience that goes way beyond the usual and ordinary. Then you have to try Dimension One Spas. Dimension One Spas has grown to become the world’s leading manufacturer of hot tubs and swim spas for 35 years. Focused on a higher quality of design, performance and value. They have built their four product lines and 30 patented features. With the goal of providing customers the ultimate difference in hydrotherapy experience. For them to lead healthier and happier lives. The company was first founded in 1977 at La Mesa, California. In 1981, they were the first one to manufacture a insulated spa that can be built in ground or above ground. They applied various technological researches and innovations in their hot tubs ( electronic controls, water purification system, jets, and etc.). Their passion to build hot tubs that and would last longer driven their every innovation. Dimension One was also the first company to introduce the curvilinear spa design. You can get your own extraordinary spa experience from its four product lines. Which are The Bay Collection, Reflections Collection, At Home Collection and AquaFit Systems. All Dimension One Spas offer all the luxury that you can get in a spa experience only made even better. 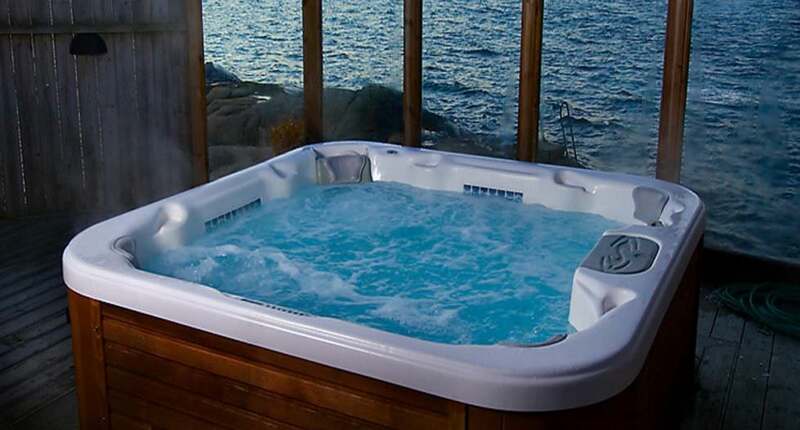 The Bay and Reflections Collections are luxury hot tubs. It offer various models that could fit small groups of 2 to large groups of 10. They are fully equipped. Providing customers with the best hydrotherapy experience they can get from luxury spas. At Home Collections are friendlier to the pockets. It’s Dimension One Spas line of affordable luxury hot tubs. And if you’re looking into more than getting relaxed but fit as well, then the AquaFit System is for you. They manufactured All Dimension One Spas lines keeping into mind the difference that can be given to customers. Who deserve to experience only the extraordinary. Everybody should know that the most important feature in your hot tub is water. It is what you soak yourself into so it is very much necessary that it be clean and safe. Not just for you but for your family and friends as well. Most manufacturers use ozone as their primary agent in purifying water. Dimension One Spas turned it way better in their UltraPure water filtration system. It mixes ozone and water three times. To ensure ozone comes in contact with every drop of water turning water in its purest form as possible. If the UltraPure water filtration system is still not enough for crystal clean water. Dimension One Spas took cleanliness further. By incorporating ultraviolet light in their UltraPure PLUS system. UV light comes in contact with 8 gallons of water removing remaining impurities. Now that’s crystal clear! Every Dimension One Spa has built in powerful jets that are designed uniquely different in order to provide the right hydrotherapy massage for the right muscles. This can be done by simply spinning the jets and adjusting the nozzles. Jet Therapy Pillows are also present to provide not just a comfortable head support but a powerful neck and shoulder massage as well. It can also be adjusted in multiple positions. With the use of the M-Drive, you can control every aspect of your hot tub’s operation and with the dynamic massage sequencer, you can choose from a number of automated massage sequences to turn up your simple hot tub soak into an extraordinary hydrotherapy experience. In order to keep costs low, Dimension One Spas fully insulate their hot tubs using a full foam insulator in their spa structure. Also, they use a titanium heater that provides optimal heat recovery and consumes a very low amount of energy. Each spa has gone through careful examination and has passed the California Energy Commission’s requirements. What probably set Dimension One Spas apart from other brands are all the fun extras that come along in their hot tubs that enhance their superior spa therapy experience. Optional LED lights can be placed in the exterior of the hot tub to enhance the feel of a luxurious spa; dynamic LED lighting indicates the status of your spa; marine grade Poly Panar audio system provides additional music with its iPod docking station, high quality speakers, bluetooth and auxiliary inputs; Liquid FX provides an interplay of light, sound and shadow through the use of fountains and lighting effects that sets up the mood. With all these, even before you dip your toes in your hot tub, you are already experiencing the extraordinary spa therapy experience you can only get from Dimension One Spas. Talking about warranty, Dimension One Spas top the list. They offer the longest warranty in the hot tub industry and unlike others that decrease as to their scope as years pass by, you can get the same coverage from the day you first purchased your hot tub to the day your warranty will end in all of Dimension One Spas. Lifetime Warranty is even offered in their UltraLife shell and Envirotect skirting. ← Decent Covers Over Cheap Ones: Which One? December 21, 2014 jm7ew Comments Off on The Spa in a Box will Give You Affordable Spa Luxury!